Today’s final pick in The 2018 PopCult Gift Guide is perfect for any fan of The Beatles Yellow Submarine. Somewhat lost in the buzz over 2018 being the 50th anniversary of The Beatles (The White Album) is the fact that it’s also the the golden anniversary of another Fab Four milestone. 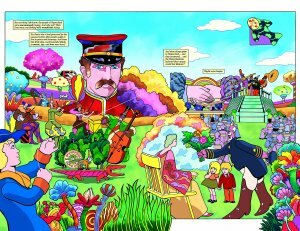 Celebrating the 50th anniversary of the Beatles’ Yellow Submarine comes this fully authorized graphic novel adaptation. It took a long to get here, but it was well worth the wait. Originally begun in 1999 for Dark Horse, that project fell through with quite a bit of the work having already been done by writer/artist Bill Morrison. Morrison, is the co-founder of Bongo Comics, who until recently published the hugely successful Simpsons comic range of titles. He is the current Editor of the famous Mad Magazine. He started his career as a technical illustrator before finding work at Disney where he created promotional art for Cinderella, Lady and the Tramp, Bambi, Peter Pan, Cinderella, The Jungle Book and The Little Mermaid, among others. He also produced his own comic called Roswell: Little Green Men, published by Bongo. After sitting on the shelf for nearly two decades, Titan Comics acquired the license for The Beatles Yellow Submarine, and on hearing about this aborted project, reached out to Morrison, who revisited and completed his graphic novel adaptation between leaving Bongo Comics and being hired as the new editor of Mad Magazine. The results are stunning. You probably know the story. The Beatles are recruited by the Captain of the Yellow Submarine to help him free Sgt. Pepper’s Lonely Hearts Club Band, and the world of Pepperland from the music-hating Blue Meanies. 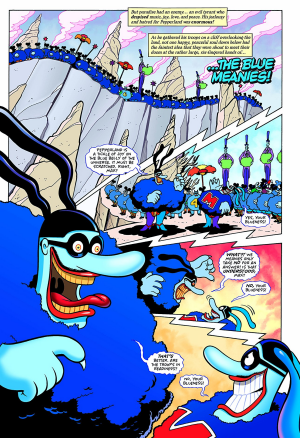 The music-loving, underwater paradise of Pepperland has been overrun by the music-hating Blue Meanies and their leader, Chief Blue Meanie. They turn the people of Pepperland into living statues by dropping apples on them and imprison the Pepperland’s guardians, Sgt Pepper’s Lonely Hearts Club Band inside a soundproof blue glass globe, before confiscating all the music instruments in the land. Pepperland’s mayor sends aging sailor, Young Fred out in the fabled Yellow Submarine to find help. He travels to our world where he stumbles across the Beatles and begs them to help him free his world. They agree and head back to Pepperland, teaming up with Jeremy The Nowhere Man along the way to help overthrow the evil Blue Meanies through the power of music and love. Who knew at the time that the Red Meanies would turn out to be an even bigger menace? Unlike the 1968 Gold Key Comics adaptation, this graphic novel actually follows the plot of the movie. Deadlines were tight when the movie came out, and the comic book that Gold Key published was based on an early shooting script that was heavily revised before it made it to the screen. It’s still a wonderful book that ought to be reprinted someday, but it’s true appeal to Beatle fanatics is that there are entire sequences in the Gold Key comic that never made it into the movie, and there are bits of the movie that didn’t make it into the comic. This graphic novel adaptation matches the movie perfectly. Morrison adapts his style to the Heinz Edelmann designs used for the movie, and this is a note-perfect adaptation. The basic graphic novel retails for just under thirty bucks and can be ordered from any bookseller by using the ISBN code. Of course, Amazon has it with a hefty discount. I try to encourage everyone to use local bookstores, but I also understand that money might be tight, so finding the right price can also be very important. There is also a deluxe boxed set, which to be honest, I find to be over-priced. 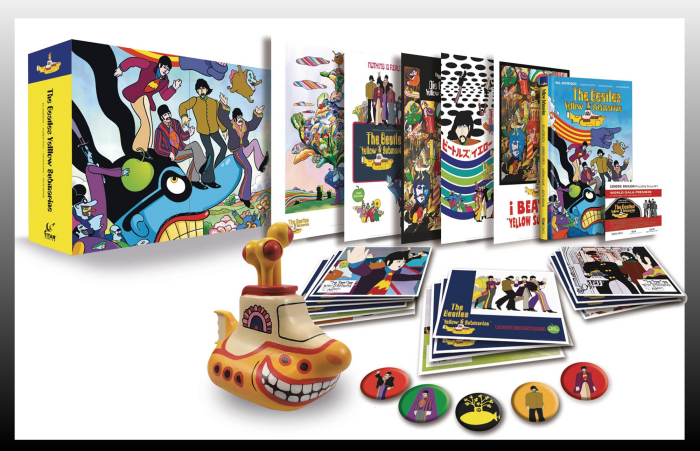 In it you get the same graphic novel, a cartoony toy Yellow Submarine, 5 Yellow Submarine pins, an exclusive Artcard signed by Bill Morrison, 16 Yellow Submarine Lobby Cards, 4 Yellow Submarine Movie Posters, and a Yellow Submarine Movie Premiere Ticket, all faithfully reproduced from the originals. It’s a really nice boxed set, but you’ll pay between $150 and $200 for it, and that’s a bit much. As you can see below, it’s really impressive, and it’s limited to 1968 copies worldwide, but I can only inform you of it. I can’t really endorse it (if I did, it’d be a BIG TICKET DAY item). If you are interested, Google will lead you to a few online dealers.